Andrea Quattrini, marine biologist and co-science team lead for Leg 1 talks about telepresence and the 2013 Northeast U.S. Canyons Expedition. Video courtesy of the NOAA Office of Ocean Exploration and Research. Download video (mp4, 39.6 MB). As "America’s Ship for Ocean Exploration," NOAA Ship Okeanos Explorer’s sole assignment is to systematically explore Earth’s largely unknown ocean. A major task for this mission is to reach out to teachers, students, and the general public so that they may become engaged with expeditions dedicated to purposes of discovery and the advancement of knowledge. 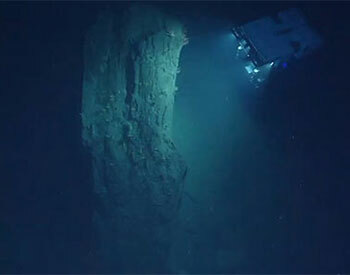 Okeanos Explorer Expedition Education Modules (EEMs) are designed to help accomplish this task. The Northeast U.S. Canyons Expedition 2013 offers a unique opportunity for explorers of all ages to investigate the unknown and poorly-known submarine canyons and seamounts along New England’s continental slope. This summary explains why scientists and educators are interested in exploring the Northeast U.S. canyons area and what we might learn from our efforts in this region as we strive to further understand the 95 percent of our planet that is virtually unexplored. The Northeast U.S. Canyons Expedition 2013 will be divided into two separate legs; the first leg will explore western portion of this region, looking at several canyons, landslide features and unconfirmed New England seep sites; and the second leg will explore the northeastern portion of this region, looking at canyons and the Mytilus Seamount. Educators and scientists working with NOAA developed lesson plans for students in Grades 5-12 that are specifically tied to the science and technology associated with this expedition. These lessons support the Next Generation Science Standards performance expectations (and their associated Common Core State Standards Connections), and the Ocean Literacy Essential Principles and Fundamental Concepts. On this page, will also find links to other NOAA expeditions on the Ocean Explorer website that have content and lessons that relate to the Northeast U.S. Canyons Expedition 2013. The Multimedia Discovery Missions are a series of interactive multimedia presentations and learning activities that address topics, including plate tectonics, subduction zones, and seamounts. Each of the expeditions highlighted on this page covers topics similar to those of this expedition. Each expedition web page has an education component with associated lesson plans on topics including seamounts, canyons, deep-sea biological communities, and the technologies used to explore these areas. To see archived video highlighting some of the careers that will be represented onboard the ship during this expedition, click on the OceanAGE Careers page.